Changes are highlighted in green. If an ability is not listed, there was no change to it. Final Text: Deal Physical damage to all enemies with a 55% chance to inflict Ability Block for 1 turn and a 50% chance to inflict Defense Down for 2 turns. Inflict Target Lock on enemies that are Critically Hit for 3 turns. Contract: Score Critical Hits against debuffed enemies 10 times. Reward: All Bounty Hunter allies gain +25% Offense and Potency for the rest of the battle. Final Text: (ZETA) IG-88 has +45% Critical Damage and recovers 50% Health whenever he damages a Target Locked enemy. In addition, he has +20% Offense for each debuffed enemy and +50% Evasion against Target Locked enemies. While IG-88 is active, Target Locked enemies can't recover Health or Protection. Payout: For the rest of the battle, IG-88's Critical Hits to enemies reduce their Tenacity by -10% (stacking), his attacks ignore 50% Defense of Target Locked enemies, and he has +25% Offense if there is an enemy with Target Lock. IG-88 joins Imperial Probe Droid as one of the only characters to provide Target Lock in character combat, which allows him to work effectively in both Bounty Hunter and Droid teams. IG-88 hammers opponents with a strong basic attack, and the tenacity shredding effect granted by his contract payout helps Bounty Hunter teams apply more debuffs as battles progress. IG-88 becomes more of a menace as the battle rages on by gaining bonus evasion and health from Target Locked enemies, while ignoring fifty percent of their Defense. Final Text: Deal Physical damage to target enemy and Dispel all buffs and debuffs on them. Deal 30% more damage for each effect Dispelled. If this attack defeats the target, they can't be Revived and Boba Fett reduces his cooldowns by 1; otherwise, inflict Healing Immunity for 2 turns. This ability can't be Evaded. Reward: All Bounty Hunter allies have +25% Tenacity for the rest of the battle. Payout: Boba Fett gains 100% Turn Meter and, for the rest of the battle, has +50 Speed and additional Defense Penetration equal to 200% of his Defense Penetration. Boba gains a powerful damage boost when he completes his contract, tripling his Armor Penetration and taking a turn immediately. Boba Fett also acts as a great source of Dispel, damage, and control for the Bounty Hunter faction. His ability to Revive helps make the team more resistant to burst damage, while his leader ability doles out Critical Damage, Critical Chance, Speed, Health and Turn Meter to the whole squad. Final Text: Deal Physical damage to target enemy with a 70% chance to gain Potency Up for 1 turn. When attacking an enemy with a Thermal Detonator, this attack has +25% Critical Damage. Final Text: Place Thermal Detonators on all enemies that explode after 2 turns. When these Thermal Detonators explode, Greedo gains 25% Turn Meter. Final Text: (ZETA) All allies gain Critical Chance Up for 2 turns. Reduce target enemy's Turn Meter (Can't be Resisted except by Raid Bosses) by an amount equal to Greedo's Critical Chance. Then Greedo gains an equal amount of Turn Meter removed this way. If the target is reduced to less than 20% Turn Meter, Stun them for 1 turn, which can't be Resisted. Additionally, Dispel all buffs on target enemy. This attack can't be Evaded. Reward: All Bounty Hunter allies have +50% Critical Damage for the rest of the battle. Payout: Greedo has +50% Health Steal, +25% Critical Damage, and +75% Counter Chance until the end of the battle. With increased damage, fancier thermal detonators, and a brand new ability that dispels and stuns, Greedo easily earns his place in a competitive Bounty Hunter squad. His kit includes great counter chance, critical damage boost for the whole squad, and enough health steal to give him increased sustainability during battle. Greedo also uses two-way Turn Meter manipulation during the fight to increase his actions while lowering the opponent’s chances to strike. Final Text: Deal Physical damage to target enemy with a 75% chance to inflict Speed Down for 3 turns. If the target had 50% Turn Meter or more, they are also Stunned for 1 turn. Final Text: Deal Physical damage to all enemies. Deal Physical damage 2 times to random enemies, dealing 50% less damage. Then, inflict negative effects on all enemies that suffer a Critical Hit. Effects inflicted depend on number of Critical Hits scored. Finally, apply 1 Thermal Detonator to a random enemy target for each Bounty Hunter ally. This attack can't be Countered. Reward: All enemies have -20% Offense for the rest of the battle. Final Text: (ZETA) Whenever Dengar receives a Critical Hit, he gains Stealth for 2 turns. Whenever an enemy evades Dengar's attacks, he gains +60% Turn Meter. Whenever Dengar suffers a debuff, he gains Tenacity Up for 2 turns. While Dengar is Stealthed, enemies can't gain Stealth. Whenever this ability's effects trigger, Dengar recovers 3% Health and Protection. Payout: Dengar has +25% Offense and +25% Speed. In addition, while Dengar is Stealthed, he has +60% chance to Assist when another Bounty Hunter ally uses a Special ability. Dengar’s rework turns him into a survivable enabler for the rest of the team. The recovery he receives from “Grizzled Veteran” keeps him in the fight and makes him more durable than ever before. When Dengar is stealthed he denies opponents the ability stealth, which is not only satisfying, but can also be crucial in tracking elusive prey. Once his contract is fulfilled, Dengar starts racking up the damage with constant assists that have a chance to call other assists. Dengar is versatile, as he can be paired with a Bossk lead for more recovery, or a Boba Fett lead for more Turn Meter. Nope, she didn't make the list this time around. Not sure if addressed somewhere else but is he BH reworking coming at the same time as the ship overhaul and chat update? 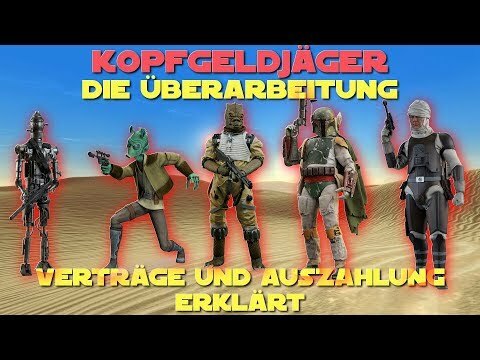 Does anyone know if there is a reason why the contracts for Greedo and Dengar explicitly state that all BHs can help, while this is not the case for Bossk, Boba and IG-88. Does that mean the contract from e.g. Boba can only be fulfilled by himself? I didn't get to watch all the videos yet, so i'd appreciate any insights. 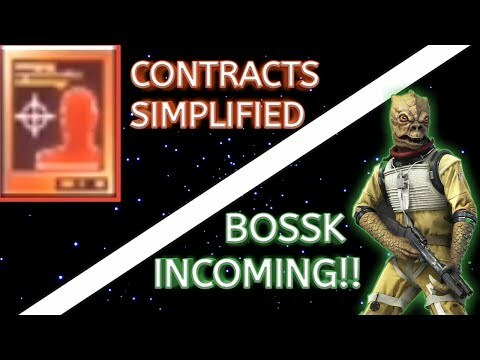 Overall the rework looks pretty dope: A Bossk lead Boba will get +100 speed once the contract is fulfilled. Crazy. So I've seen some reworks on some of the bounty hunters. Ig-88, Dengar, Boba, and Greedo. What about Zam? What about Cad Bane? Are they going to get contracts? Reworks? I haven't seen any discussion regarding them. Discuss. Answer. Adapt. Overcome. Destroy. They’ve said Zam and Cad aren’t getting reworked right now. They may not have been reworked, but I'm sure they will still count towards the contracts and get the bonuses once the contracts have been completed due to the BH tag. But we knew from the moment the rework was announced that only the OT bounty hunters were getting changed. Why the thread now? If you followed the videos. Each BH placed on an ally spot gain his own reward in addition to the leader's reward. Zam and Cad will not have their own reward for being a Bounty Hunter. Why? If you followed the videos, this question was answered. They didn't have enough time to rework every bounty hunter, so they focused on the original trilogy for now. The Four reworks and the addition of Bossk are all from Empire Strikes Back while the others are from the clone era. Yeah, when they announced the rework I was like cool bounty hunters, but.... why just OT? I mean it's not like Cad and Zam where already in a great place. They're not. And now it turns out that the faction rework doesn't even help them by virtue of making the faction better, it just makes them worse because without their own contracts they'll be an active detriment to the team... Why? Most likely because they want to test the contracts on a smaller sample before making it a thing for all BHs. That, or they are planning to give prequel/CW BHs a separate identity based on something else. is it just me or does Boba's leadership contract kinda lackluster compared to the others.... 25% bump in tenacity is not actually enough to resist much.... is it just meant to kind of counteract the fact BHs do not have a group cleanser? I am very excited for the new Bounty Hunter contacts and I cannot wait to play with them and learn how to use them. But with new content comes more questions. I am a little disappointed that Cad Bane did not get a rework yet, but since this was a focus on the original trilogy I understand. But does this mean Bounty Hunters will get a 2nd rework to include the Prequel Bounty Hunters in the future, with the possible chance to add Jango and possibly some others from the Clone Wars? Definitely. Probs after they rework separatists and release padme and company. Then we’ll get jango as leader of a second BH squad with their own unique synergy. Probs won’t be for another 9-12 months tho. There are two possibilities: either they are testing contracts now and the prequel BHs will get them later, or they have some separate identity in mind for Cad and company. Either way, I would say that the rework for the rest is a matter of time. It's because his leader ability is already fantastic. Eh? "2nd" Bounty Hunter rework? At least they still can make use of the contract rewards that are awarded to all Bounty Hunters. Unless CGEA is gonna take that out too.